300 pages | 4 B/W Illus. 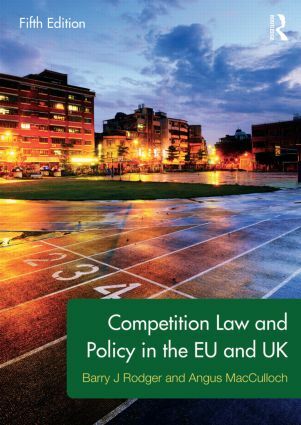 Competition Law and Policy in the EU and UK provides a focused guide to the main provisions and policies at issue in the EU and UK, including topics such as enforcement, abuse of dominance, anti-competitive agreements, cartels, mergers, and market investigations. The book’s contents are tailored to cover all major topics in competition law teaching, and the authors’ clear and accessible writing style offers an engaging and easy to follow overview of the subject for course use. The fifth edition provides a full update for this well-established title, presenting and contextualising the impact of key cases, as well as changes to enforcement practice, and at a legislative and institutional level. There are new, separate chapters in this edition on private enforcement and UK market investigations to reflect the increasing significance of these key areas of competition law practice. Clear, focused and student-friendly, this title offers a comprehensive resource for students taking competition law courses, and is supported online by updates to the law offered on Angus MacCulloch’s blog, Who’s Competing (http://whoscompeting.wordpress.com/). Dr Anca Chirita, Lecturer in Competition Law, Durham Law School, Durham University, UK. Barry J Rodger is a Professor at the Law School, University of Strathclyde. He is a member of the Kluwer International Competition Law Editorial Advisory Board, Vice-Chair of the Competition Law Scholars' Forum, and Co-Editor of the on-line refereed journal, the Competition Law Review. Angus MacCulloch is a Senior Lecturer in Law at the University of Lancaster. He is a founding member of the Competition Law Scholars' Forum, and is Co-Editor of the on-line refereed journal, the Competition Law Review.